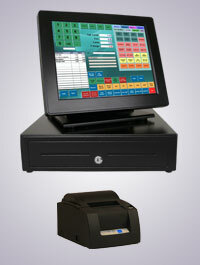 Complete POSX Touch Screen POS System. This System can be purchased as a single station system or as a multiple station system. *Credit card slides are optional. Add $100.00 per credit card slide. Our Business Plus Accounting software is included free on each Point of Sale terminal you purchase from us. Rather than making an expensive software purchase up front, you pay nothing up front and a very reasonable fee of $40 per month for support, upgrades, and software licensing. You receive unlimited telephone support during our regular business hours and free updates to the software. Your Retail Touch POS System is more than just hardware. Plus Accounting Touch POS is a complete Retail Point of Sale System built on top of a complete business accounting system. This means in addition to running your retail sales, BPA Touch POS can help you track your inventory, your accounts receivable, your accounts payable, it can also help you write checks and balance your bank account. It can run your payroll, track maintenance on your equipment, and provide all of your general ledger and accounting reports. 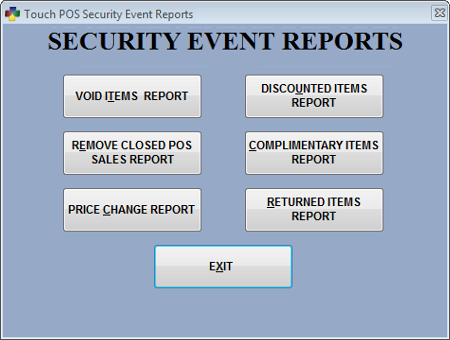 BPA Touch POS also provides over 260 reports! See description of software features below. Ultra Quick keyboardless touch screen design. Functions like receipt printing, item discounts, void item, void sale, change price, change quantity, quick pay, and many others are available right from the main POS screen. Works with barcodes scanner to scan items without ever having to touch the screen or a keyboard. Includes 8 quick sale menus for items not usually barcoded or items you need quick access to. Each menu can have up to 1000 items. Quick & Easy. 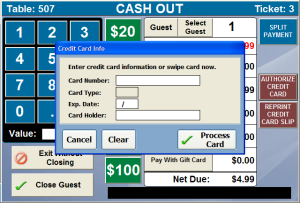 Quick cash out buttons automatically show most common cash denominations 1 touch cash outs. Enter credit card or cash payments directly to pos screen. Exact cash and exact card buttons for 1 touch cash outs. Password protect POS functions such as manually opening the cash drawer, voiding items, discounting, etc. Print reports showing items that have been removed, tickets that have been voided, and items that have been discounted. Specify which software modules and functions each employee has access to. i.e. Payroll, General Ledger, Inventory Control, etc. Prevent access to sensitive data on the system. BPA Touch Point of Sale is built on our Business Plus Accounting software package, and includes a complete set of business and accounting tools fully integrated with the Point of Sale. These few features are just the beginning of what BPA Touch POS can do. Please see the feature list for more details! 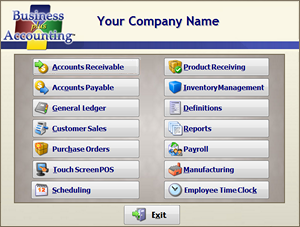 BPA Touch POS is integrated with our business system, "Business Plus Accounting". Business Plus Accounting was rated by Computer Credible Magazine as being: "By Far The Easiest To Install and Use Of Any Package We Have Ever Reviewed!" If you have out grown QuickBooks this software will work for you. BPA Touch POS includes X-Charge and PPI Paymover for Integrated Credit Card Processing. We have partnered with these merchant account providers to provide integrated credit and debit card processing solutions. More Secure Transactions. Business Plus Accounting is a PCI Compliant Product, as are our Preferred Partners, X-Charge and PPI. PCI compliance helps protect you and your customers from credit card theft and helps you stay compliant with industry requirements. Simplicity with Accuracy. With integrated credit card processing, your cashiers will see a smooth flow from the beginning to end of transaction. There is no re-keying of the sales amount which virtually eliminates the chance for error. X-Charge and PPI Paymover are software products provided by Accelerated Payments and Payment Processing Incorporated. To use these integrated solutions you will need to sign up with a Merchant Account. If you have a current merchant account provider or are unable to run with one of our preferred partners, we also support integrated credit card processing through PAYware PC from VeriFone, for an additional fee. Business Plus Accounting Touch POS software is included at no charge with each hardware station you purchase. BPA Touch POS goes well beyond competing systems. This is by far the most comprehensive Point of Sale product on the market today. And knowing the expense and the risk new business owners face we are offering you this great software product for a support, upgrade and licensing fee of $40.00/month.